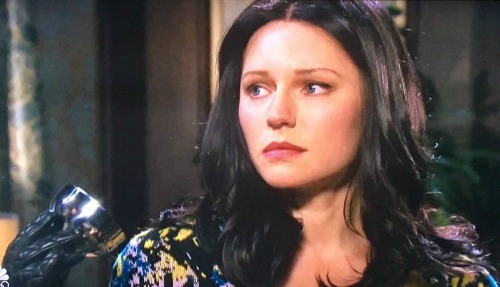 Days of Our Lives (DOOL) spoilers tease that poor Abigail (Marci Miller) has quite a fight ahead of her. She’s been stuck in that imaginary office for what seems like forever! Abigail can’t make sense of all this, but she knows she wants to get back to her loved ones. She’ll continue her efforts to get home, but her alters won’t make it easy. Fortunately, one obstacle will soon be eliminated. Days of Our Lives spoilers say “Gabby” will work out some sort of agreement to help Stefan (Tyler Christopher). She may step aside as long as Chad (Billy Flynn) promises to let Stefan live. He gave his brother a brutal beating, but he might vow to back off if “Gabby” disappears. Days spoilers state that “Gabby” will finally fade away, but Abigail’s other alter will make a sudden reappearance. DOOL fans know “Dr. Laura” wants to keep Abigail in the dark on something huge. She claims that Abigail killed Andre (Thaao Penghlis) and that’s why her mind’s protecting her. Chad will be taken aback when he meets “Dr. Laura” next week. He’ll hate the fact that Abigail’s stuck in such a mess. Thankfully, Chad won’t give up on his love. Days of Our Lives spoilers say he’ll try everything to get through to Abigail. He’ll beg “Dr. Laura” to let Abby out so he can help her. Since “Dr. Laura” thinks she knows best, Chad will have his work cut out for him. He’ll struggle to change “Dr. Laura’s” mind about sheltering Abigail. Luckily, Abigail will be just as determined to break down “Dr. Laura’s” walls. Between the two of them, Chad and Abigail should be able to get the job done. Of course, the battle’s far from over. Abigail will have to face the reality of what she’s done in alter form. She’s been attacking people, holding them hostage, lying in court, sleeping with Stefan and so much more. Abigail will also have to deal with the devastating blow of killing Andre. All these revelations will really hit her hard. DOOL fans can expect some difficult moments for Abigail, but at least Chad will give her his support. Let’s hope “Chabby” can make it past the drama. We’ll give you updates as other Days news comes in. Stay tuned to the NBC soap and don’t forget to check CDL often for the latest Days of Our Lives spoilers, updates and news.